Substantial differences between Russian and Ukrainian law mean that Crimea’s adoption of Russian legal norms will have far-reaching consequences for two groups: drug addicts on replacement therapy programs and those serving out sen-tences in the peninsula’s jails. Crimea is getting ready tobe brought underRussian jurisdiction, meaning money, bank cards, passports and other documents must all be replaced.Substantial differencesbetween Russian and Ukrainian law mean the changes will also affect drug addicts undergoing replacement therapy treatment as well as prison inmates serving time in Crimean jails.In these cases the adoption of Russian law poses some difficult questions. 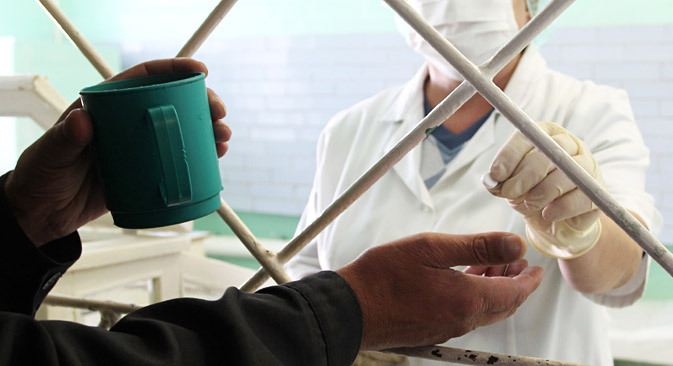 In Russia, drug replacement therapy, which has long been used in Ukraine, is considered illegal, meaning that Crimea's absorption into the Russian Federation may well put an end to local drug abuse treatment programs. The change could have life-threatening repercussions for nearly 800 drug addicts in Crimea, who have for several years already been receiving methadone as part of the replacement therapy program. In fact, according to a report by English-language newspaper The Kiev Post, supplies of methadone and buprenorphine, which these addicts need in order to function normally, have been blocked from entering Crimea from mainland Ukraine since the end of February, leaving stocks on the verge of running out in Crimea. The Ukrainian program views drug addiction as a chronic disease. Those who are unable to overcome the addiction themselves regularly come to a medical institution and, under medical supervision, are administered replacement drugs, such as methadone and buprenorphine. Replacement therapy has been approved by the World Health Organization and by the UN Office on Drugs and Crime, and covers about a million patients in some 60 countries. Medics point out that replacement therapy reduces crime since addicts are not pushed to obtain drugs through criminal means. In Russia, however, replacement therapy and the import of methadone for medical purposes are banned. Medics in Crimea and Sevastopol are divided in their views on the future of replacement therapy. "This is far from the only way of treating drug addicts," says Vladimir Stroyevsky, chief doctor at the Crimean Republic Narcological Clinic. He adds that the replacement therapy program in Crimea is a pilot project and the authorities are ready to abandon it in favor of treatments allowed in Russia: detoxification and behavioral treatment. For their part, local psychotherapists are urging Russian authorities not to shut down the methadone therapy for those whom it helps. "The program should probably not be expanded, but a way must be found to provide the necessary drugs for those who are already on this program. In Belarus, this treatment is legal. If Crimea, as part of the Russian Federation, which forms part of the Customs Union, manages to arrange the supply of drugs, there should not be a problem," says practicing psychotherapist Mikhail Segalov. The changes will affect not only drug addicts receiving treatment: Two prisons, one correctional facility and one remand prison located on the territory of Crimea will now fall under the supervision of the Russian Federal Penal Service. However, there is no established mechanism for transferring prison inmates from one country's penitentiary system to another's. Once Crimean prisons become Russian prisons, inmates will have to change into the standard Russian prison uniform. They will have to abide by rules and regulations that exist in Russian penal institutions, which are slightly different from those in Ukraine. In particular, prison inmates in Russia have more time allocated for outdoor walks, while their Ukrainian counterparts can watch more TV and make more phone calls. Inmates will also be given the option of receiving Russian citizenship. Under Article 5 of the treaty on Crimea's unification with Russia, all people located on its territory are automatically considered to be Russian citizens and each of them have to decide for themselves whether to accept new citizenship or not. A procedure whereby inmates will be issued with Russian passports has not yet been considered but, according to the Crimean authorities, should be decided upon soon. There is also uncertainty about the fate of the local football clubs, SC Tavriya Simferopol and FC Sevastopol. The teams' representatives have already announced that they will leave the Ukrainian Premier League, however they are unlikely to be automatically admitted into the Russian Premier League. Finally, a fundamental change will affect the whole peninsula on March 30, when Crimea switches from Ukrainian to Moscow time, which is two hours ahead. Based on material published by: Moskovsky Komsomolets, RIA Novosti, Kommersant.